We have reached the Mediterranean coast and are parked up in a large aire in Gruissan, which will be our final stop in France this season. It is free to stay here during the winter and Kelpie has seen his first busy motorhome stopover, though it also looks like many are here for the duration of the season (43.10416, 3.09961). Yesterday we started heading down towards the Mediterranean coast – a bit nearer the sun. There’s a severe weather warning for the Spanish Mediterranean coast for the next few days. With the weather pleasant and settled on the SE French coast, we decided to wait out the storm before heading into Spain. We headed for Gruissan. A small fishing village with a modern marina and resort built beside it, not far from the city of Narbonne. Looks like we may be experiencing some rain ahead! In Narbonne we took a wrong turn with 2 road exits virtually beside each other. This had us heading towards the toll gates where we definitely did not want to be. Continuing on around the roundabout we were taken to a spaghetti junction in a four leaf clover shape and I kid you not, we were taken around every fecking loop in this junction before we reached the road we needed! We arrived at the our first choice aire in Gruissan Plage which was right beside a pretty angry looking Mediterranean sea – and CLOSED for the winter. We decided to park up anyway for s short while, take in the view and make some lunch. Better to take in the view from inside! We moved onto our second choice the other side of Gruissan which was also closed for the winter with 4 huge boulders placed across the entrance! 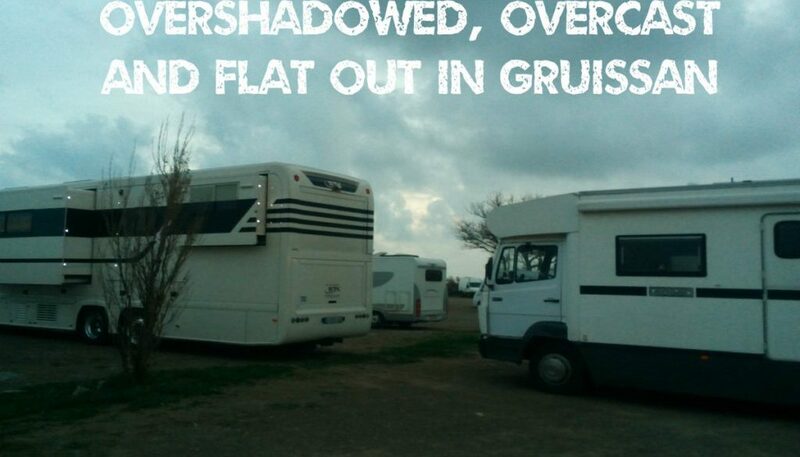 Third time lucky – we found a huge aire beside the marina at Gruissan. After the quiet little villages and aires we’ve been staying at, the Gruissan Quatre Vents (Four Winds) was a bit of a culture shock. There were approx 50/55 vans already in the aire which holds over 100. During the winter it is free to stay here including free services, but the showers were locked and no electricity available, which would prove to be a problem later on. The largest motorhome in the aire was the biggest I’ve ever seen. German registered – it had two slide outs at the sides plus electric steps that came down automatically when the door opened – a huge garage and LED lights all round the outside. Of course me the peasant that I am, I had to take a pic of it beside ours lol. There were a lot of big mohos on the aire, mostly French, German and Netherlands registrations. We managed to use the service area before it got dark and the rain came on – first rain we’ve seen since we left Northern Ireland – sounds like it could be a rough night. No EHU at this aire but its free so we’ll probably stay for a couple of days. Will see how the weather turns out. Maybe try to get booked onto a site for a couple of days soon to get some washing done and get a real shower. There is a strong wifi signal generated all around the marina but it is a paid-for service payable online and costs €7 per day – a bit too rich for my liking so we will use our Three Feel At Home package. We went for a dander in search of the daily baguette and and walked around the marina – full of expensive boats and equally expensive restaurants. There are 3 basins to the Gruissan marina with space for 1,300 yachts! The largest marina I have ever seen and it looked virtually full. No shortage of money around these parts. Lots of people were enjoying lunch but our baguette beckoned us so we soldiered on. We found a small boulangerie and had a coffee before heading off in search of a launderette to catch up on some laundry. Google indicated that there might be a “laverie” close to the marina but it turned out to be a (closed) cafe. With no sign of anything resembling a launderette after walking around for over an hour following another sign in the town, we made our way back to the van to check if we were even using the correct French word! Alan managed to find one on Google maps which was – wait for it – in the car park of the French supermarket Intermarche – about 4km away. So off we went to kill two birds with one stone – shopping and laundry – in the same place! Brilliant idea – two washing machines up to 8kg and up to 18kg and one huge dryer. The washing cost €4 and the dryer was €1 for 10 minutes – 30 minutes to wash and 20 minutes to dry everything – how fantastic is that. I said to Alan – they should have something like this at home – and literally the next day there was a Facebook post about one opening in the Park Centre in Belfast. We’ll see how long it takes til it’s wrecked or some poor sod’s washing is stolen lol. With laundry done and fresh bedclothes on the bed, things were looking up and we decided we would move further south the next day. We got up on Sunday morning all ready to drive a bit closer to the sun but the starter battery was completely flat, the engine wouldn’t even turn over. Our engine is stopped by a pedal on the floor which creates a vacuum cutting out the engine. It feels strange when you remove the keys and the engine is still running! When we arrived back from doing the shopping and laundry, Alan stopped the engine as normal with the foot pedal. At the same time, I was climbing over the seats from the cab and fell flat on my face on the floor of the motorhome. Alan jumped over to help me to my feet and in the mayhem, he had forgotten to remove the keys which meant that the ignition had been on all night draining the starter batteries. “No problem” says Alan, “I’ll just give ADAC a call and they’ll sort us out”. Turns out the membership Alan thought he had arranged before we left Ireland hadn’t actually been processed so we didn’t have any road side assistance insurance. He was advised to call the ADAC membership department to sort out the problem, but they would not be open until Monday morning! With nothing else we could do, we went for another look around the town. The view across to the old fishing village and castle. After a frank exchange of views about whose fault it was and whose it definitely wasn’t, Alan phoned and registered as a new member on Monday – but was told it wouldn’t be effective for 24 hours taking us to 12.00 Tuesday. In the meantime our leisure batteries were going down pretty fast and the day was overcast not generating any usable solar power, so we needed to get some power into them. So Alan decided to start up the generator to see if it would somehow give the leisure batteries a boost. We’d never used the generator before and probably never will again now – it’s loud – no IT’S REALLY LOUD. So loud in fact that the French people in the vans on either side of us moved to the other end of the aire. Perhaps we need an alternative power source! One lady asked if we intended to run it all day and if so could we move to a part of the site – far away. Alan explained the situation – no battery- can’t move etc etc. So she gathered up her fake grass doormat and her dog and moved to the other end of the aire with the rest of them. Eventually we were sat with about 50 metres all round us – total pariahs. On Monday a couple of French men came over to investigate our predicament and soon there were the inevitable shrugging of shoulders, flailing of arms and a cacophony of instructions flying back and forth in French, but to no avail. Our problem is our starter battery is a 24 volt system and all the other motorhomes only have a 12 volt battery which wasn’t strong enough to give us a jump start. The huge German moho in the aire was the only van with a 24v starter system and Alan asked if he would be able to give us a jump start, but his batteries were in the same place as ours and he wasn’t able to position his van in a way for the jump leads to reach. Nothing else to do but wait for ADAC on Tuesday. Eventually on Tuesday a lovely young man in a yellow van came from ADAC and was able to get us started pretty quickly. He said the motorhome probably needed a good drive to recharge the batteries, which was fine as we’re heading south a fair bit into Spain. Brilliant – self tilting trailer and 4WD beach buggy! Grateful to be on the road again we set off with much waving and “au revoirs” from our french “helpers” confident that things were well and truly sorted. Love reading you blog. My wife and I did the same in early January this year! We have no regrets and are looking forward to many years wandering Europe (Brexit permitting). Wishing you safe travels where ever you go. Steve & Tan. ps will keep an eye out for you.